This unique stainless steel portable impulse sealer makes it possible to seal bags rapidly while holding the bag with two hands. 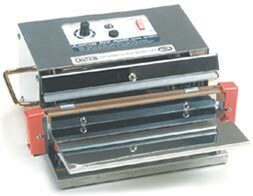 This versatile sealer allows the user to package more efficiently and quickly than the single impulse hand sealer. Makes a strong 5mm 10 inch wide seal on material up to 8 mil. Dependable smooth action. A truly great machine for many types of applications.